The Human Centipede 2 is just a flat-out bad movie, there's no other way to put it. Director Tom Six follows-up his shocking 2009 horror film The Human Centipede with a sequel that promises the “fans” more blood, poop and filth. The Human Centipede 2 [Full Sequence] stays true to those intentions, but that isn’t necessarily a good thing. In fact, that’s a horrible thing. What kind of worked in the first film doesn’t work at all in the sequel. There’s nothing even remotely funny about this film or Tom Six as a filmmaker. He proved the world wrong when they said he couldn’t make anything sicker than the first Human Centipede, but he also proved that he needs to stop making films. The Human Centipede 2 [Full Sequence] takes place in a world outside of the one established in the first film. 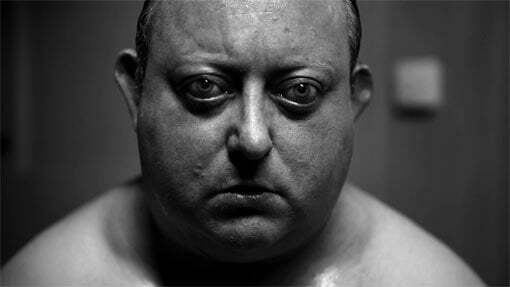 The main character Martin (Laurence R. Harvey) is an avid fan of the original film, so much that he decides to create a centipede of his own. He’s a sick and twisted individual that uses his security job to his advantage, capturing and torturing innocent bystanders while creating a work of art (in his eyes). He constructs a centipede that’s 100% medically inaccurate. The final piece of his puzzle is movie star Ashlynn Yennie, who was made famous from her role in the first film. He recruits her for what she thinks is another big Hollywood film, only to find out that she’ll soon be attached to the back-end of another sweaty human being. I’m sorry, but I just can’t continue talking about this film. It’s such a waste of existence. 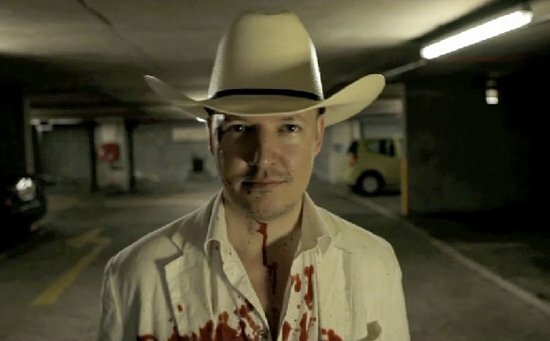 Tom Six returns as the director without a direction. The first Human Centipede was mildly entertaining in a midnight movie sort of way because it was more hilarious than gross. Sure, the concept was gag-worthy and ridiculous, but that’s what made the film kind-of entertaining. I’ve only seen it once, at a midnight showing with a large crowd and I had a blast laughing and gasping with the audience. I’ve never felt the need to revisit the film though and I never had the desire to watch a sequel. In The Human Centipede 2 [Full Sequence], he shifts focus to another disgusting character, Martin. He shoots the film entirely in black and white and he pumps up the gore and feces to the maximum level, making not an entertaining film, but a disturbing one that’s unpleasant to sit through. What makes matters worse is the slow-as-mud pacing and constant repetition. Martin slowly stalks each and every individual. When he gets close enough he strikes them and adds them to the collection. Tom Six repetitively films these motions until you simply can’t bare it anymore. You sit through at least 5 scenes that are the exact same thing. How many more times do we need to watch Martin smack someone with a wrench? The final act is drenched with vomit and disgust, as promised by Six. He gets credit for making me look away a few times, but once that initial shock factor wears off you’re left with absolutely nothing. Horror films aren’t just about making the audience sick to their stomach. They’re about scaring, disturbing and still engaging the audience. The story does matter, despite what Tom Six thinks. There’s not a single character worth remembering in The Human Centipede 2 [Full Sequence]. Martin is forced upon you right out of the gate and everyone else doesn’t matter enough to get a proper introduction. I was kind of looking forward to this film and I ended up leaving the theater with disappointed thoughts. My expectations weren’t high, yet the film still managed to scrape way below them. It’s a difficult task to sit through, not just because of the material on screen, but because of how Six presents it. The film feels too long and moves at a turtle-like speed. Skip this film if you value your life. The Human Centipede 2 [Full Sequence] comes to Blu-Ray with a full 1080p video transfer that doesn’t really help the film all that much. For starters the film is entirely in black and white, plus it was shot on video with a small budget, so it’s obviously not going to look as stunning and detailed as some of Warner Brothers classic black and white films transferred to Blu-Ray. The biggest flaw for this transfer is the inconsistency. The black and white will look strong and deep one minute and disoriented and jagged the next. The 5.1 DTS-HD Master Audio track is dynamic and strong though, which helps balance out the technical aspects of the disc. It’s brutal in its delivery, giving you a full dose of audio discomfort. Each and every bone crack, puke discharge and blood splat is heard with clarity. The disc comes with the following special features. The Human Centipede 2 [Full Sequence] gets my highest avoid-at-all-costs recommendation. If you liked the first film then please do not watch this film. If you’re a fan of gross-out horror then please do not watch this film. If you appreciate even the crappiest of crappy horror films then please do not watch this movie! It’s tasteless, slow and poorly made. The Blu-Ray looks so-so with an inconsistent black and white video transfer. The audio track is clean and easy to digest, which I can’t say for the film in general. The special features aren’t all that noteworthy and most of them are presented in standard definition. The disc is priced pretty low right now, anywhere from $12 to $15 dollars and even that is too much.